Time to start working on the SMS menu again soon.. Thank you so much! I'll spread the word and order one soon! Im interested even though I already own the genesis cart, but have two questions. What is the purpose of the video-out port, and can games be loaded from SD? AFAIK the video signal is just passed through without any modification. 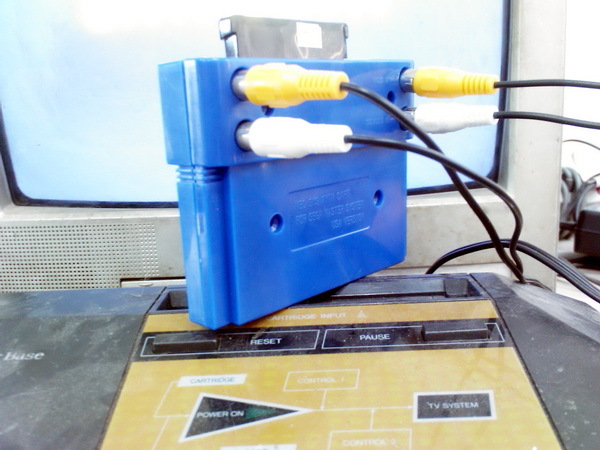 The purpose of the AV ports is so that FM music is mixed into the audio signal (for those games that uses the FM chip), since the FM chip is inside the cart. This of course requires an SMS model 1, since all model 2 consoles I've seen have only had RF output. and can games be loaded from SD? Not yet. Hopefully soon (like in the next few months). Just curious, does it work through the Power Base Converter on the Genesis? As long as the console has composite outout it should work. I can't swear on it though, since I don't own a PBC. Because I KNOW someone will ask here... the new SMS Myth menu (currently 1.0) can be found in the thread here. This menu allows you to run SMS/SG-1000 games from an SD card as well as play VGM files. I own a Power Base Converter and haven't been able to get my cartridge to work. Just a black screen with faint vertical lines comes up. Will I have to get a stand-alone Master System?